Buy 1 for $17.15Buy 2 / Save $0.92!Buy 3 / Save $3.43! Silybum marianum, L. Gaertner (Compositae), also Carduus marianus L., commonly called milk thistle. In French, it is Chardon Marie; in German, it is Mariendistel. 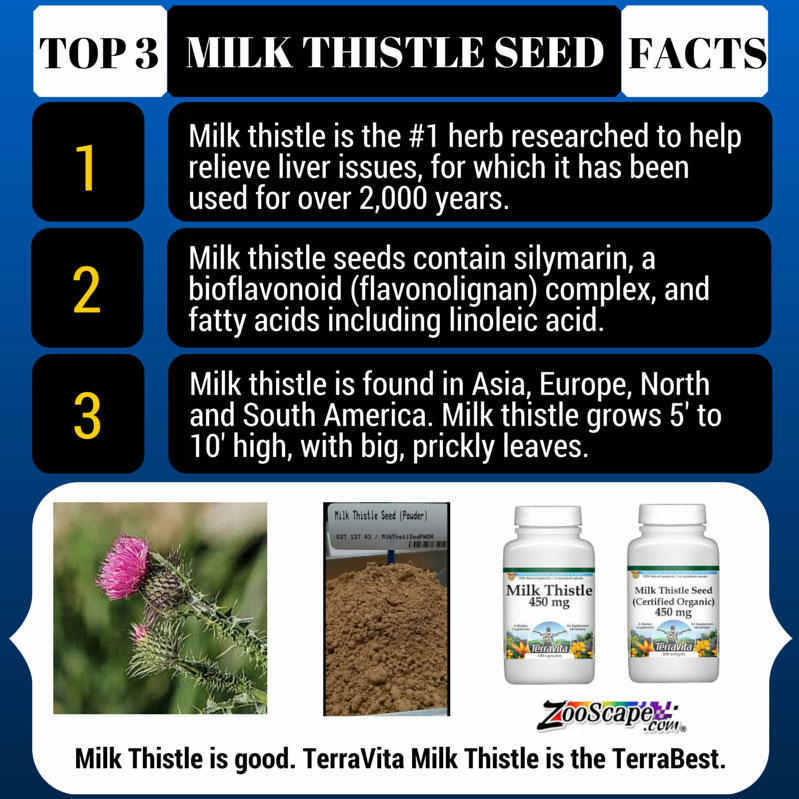 Milk thistle is in the same family as the daisy and artichoke. It grows wild in Europe and was first brought to the United States by European colonists. It is now grown commercially on both coasts of the United States. Because mature plants are covered with sharp spines, milk thistle was, and to some extent still is, planted as a barrier to keep out intruders. An extract made from milk thistle is referred to as silymarin, but silymarin actually contains three different flavonoid isomers (mirror images) called silybin, silydianin and silychristin. Silychristin is the most active of the three molecules, but most herbal supportives contain a mixture of all three isomers. The highest concentrations of silychristin are found in the seeds and roots. The name is thought to derive from the appearance of the leaves, which have white veins. In the Middle Ages it was believed the veins carried the milk of Mary, the mother of Jesus. The ancient Greek physician Dioscorides first recommended milk thistle as a support for snake bite, but by the time of Pliny, in the second century A.D., mixtures of plant juice and honey were prescribed for liver and gallbladder issues, and that practice continues to this day. During the Middle Ages, milk thistle was also used in place of ergot, to cause the uterus to contract. Milk thistle can be used as a cholagogue and emmenagogue. 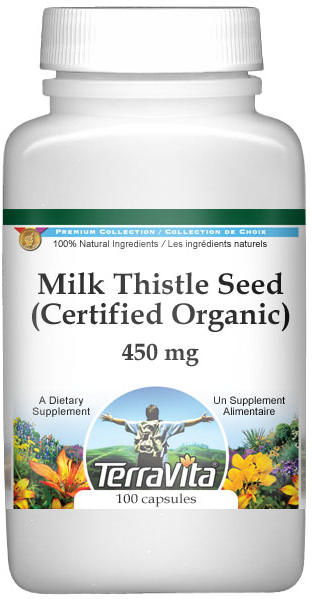 Milk thistle can be used to help support dyspeptic complaints, and for supportive product in chronic inflammation of the liver and in cirrhosis of the liver. In animal studies, silymarin protects liver cell membranes against an assortment of toxins probably by reducing or inhibiting membrane peroxidation. In addition to being an antioxidant, the results of other animal studies suggest that silymarin can reduce stomach ulcers and decrease total cholesterol, while, at the same time, increasing good cholesterol (HDL), protect against DNA damage, increase protein synthesis in liver cells, and decrease the activity of substances that are known to affect immunity levels. Not surprisingly, many patients with liver problem have begun medicating themselves with silymarin extracts. In the most recent trial, where silymarin was given to alcoholic patients with cirrhosis, no improvement could be documented. Some clinical reports from Mexico and South America suggest that silymarin helps patients with mushroom poisoning to recover more quickly, and the results of other clinical trials suggest that milk thistle extracts do help fight liver damage by external toxins, and speed recovery after a liver complaint. A range of dosages has been evaluated in clinical trials. In one study of patients with type A and type B hepatitis, 140 mg of silymarin was given three times a day. In a separate study, 60 patients with mushroom poisoningwere given 20 mg/kilogram/day (In a 150 pound individual that would amount to approximately 400 mg three times a day). The effective dosage is probably somewhere in between. Commission E recommends 12-15 grams of ripe seeds per day, or 200-400 mg per day in an extract containing at least 70 percent silymarin. None. This is a very old remedy, and there are no reports of toxicity in the modern medical literature. Not enough patients have been treated in clinical trials to be certain about this plant's clinical effectiveness, but no untoward side effects have ever been observed in any of the trials, even though efforts were made to detect them. None of the flavonoids present in milk thistle is likely to have an effect on standard urine drug screening tests.